The 1997 disaster flick starring Pierce Brosnan and Linda Hamilton will erupt on Blu-ray this July. 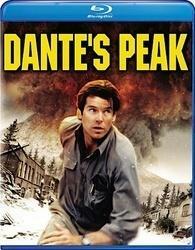 In an early announcement to retailers, Universal Studios is preparing 'Dante's Peak' for a Blu-ray release on July 26. Minor tremors lead to full blown volcanic chaos in this action thriller directed by Roger Donaldson. The Blu-ray will have 1080p video, a DTS-HD Master Audio 5.1 soundtrack, and supplements include Commentary with Director Roger Donaldson and Product Designer Dennis Washington, Getting Close to the Show: The Making of Dante’s Peak, My Scenes, and Pocket Blu. You can find the latest specs for 'Dante's Peak' linked from our Blu-ray Release Schedule, where it's indexed under July 26.